NoviFlow, a start-up based in Montreal, released a new version of OpenFlow 1.3/1.4/1.5 switching software aimed at large-scale networks. 400.1 NoviWare fully supports the OpenFlow 1.3 standard and 1.4, including all actions, instructions and match fields, as well as key features of OpenFlow 1.5, such as Copy-Fields action. NoviFlow’s products are being used as switches, WAN IP/MPLS routers, network appliances and other high-performance forwarding planes. Pica8 is introducing a Table Type Patterns (TTP) functionality in its PicOS network operating system that overcomes limitations in OpenFlow scaling for very large data centers. The company said TTP enables its PicOS to scale to 2 million flows with Cavium’s XPliant switch ASIC, and to 256,000 flows with Broadcom’s StrataXGS Tomahawk switch ASIC. Typical TCAM flow capacity in the top-of-rack installed base today is between 1,000 and 2,000 flows, and with Pica8’s TTP implementation, production networks can scale 1,000 times more. TTP defines how tables are set up in a switch, which an SDN controller can program via the OpenFlow switch protocol. The development of a TTP-based approach has been motivated by several factors, including: to maximize the available capacity, to better accommodate heterogeneity of existing hardware switches, to enable future innovation in hardware switches through more seamless SDN application development, and to enable granular and automated communication between application / controller developers and switch vendors. TTP is in early release and will be generally available with PicOS in March. Blueprint: Can OpenFlow 1.3.1 and TTP Enable SDN for Carrier Networks? Software Defined Networking (SDN) is a trend that continues to garner widespread industry attention these days due to its ability to manage network complexity via a network-wide software platform. Perhaps the most well-known of all SDN instantiations is OpenFlow; the industry’s first standard communications interface between the control and forwarding layers of an SDN architecture. Originally introduced by Stanford and later taken over by the Open Networking Foundation (ONF) consortium, the technology has steadily amassed a growing community of users. And it’s those users who have helped guide the technology’s evolution through the years. 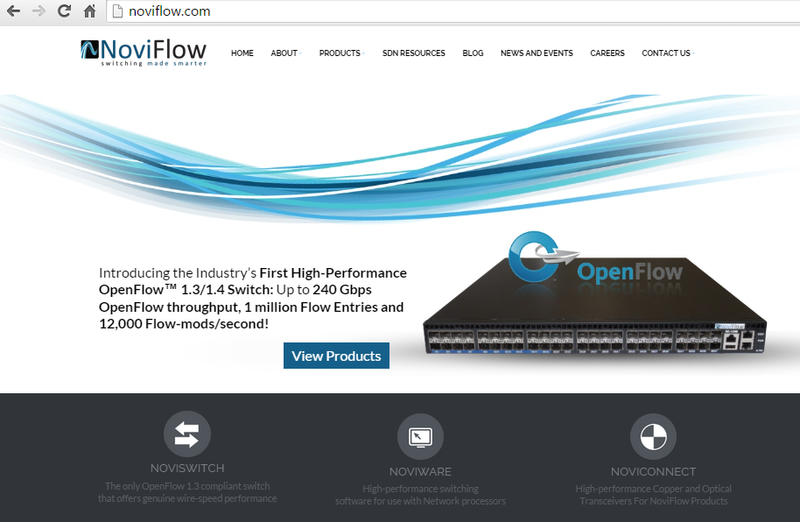 A perfect case in point is the introduction of the OpenFlow 1.3.1 switch specification. It was developed in direct response to the community’s need for a switch that mapped to OpenFlow; a capability that would help enable SDN for carrier networks. The problem was figuring out just how to make it happen. That task fell to the ONF’s Forwarding Abstractions Working Group (FAWG). rs coming in and make forwarding decisions. This approach; however, was at odds with what the OpenFlow community wanted. It wanted a uniform model that could be used to describe an OpenFlow switch; a single table with entries in it that could be used to design a switch with that construct. But switches don’t have that construct; they have several different constructs. And they are typically made out of several smaller tables that are used to look up different parts of a packet header, rather than just one massive table. Switches just don’t have the same resources as servers. Porting OpenFlow 1.0 to switches became a challenge and limited its capabilities on real-world switch hardware. Faced with this reality, FAWG began to consider another possibility. Rather than redesigning all switches to fit the OpenFlow model, perhaps it could just modify OpenFlow to be more applicable to real-world switches. As an example, consider that when we say the word “car” today, it quickly conjures up an image of a vehicle with four wheels, a steering wheel, gear shifter, and brake and gas pedals. This uniform description ensures that you have the ability to drive a car, regardless of its types (e.g., SUV or sedan), as long as it meets the key elements specified in that description. This same type of uniform description is exactly what FAWG set out to create, only for the switch. What it came up with is a way to describe a switch in a uniform manner using Table Type Partitioning (TTP) that OpenFlow understands and that is inclusive enough to allow many different real-world switches to fit that description. TTP is leveraged in OpenFlow 1.3.1. A TTP is an abstract switch model that describes specific switch forwarding behaviors that an OpenFlow controller can program via the OpenFlow-Switch protocol. The switch forwarding behaviors are described via a sequence of tables that have ingress port information coming in and match fields going out. OpenFlow 1.3.1 specifies an OpenFlow switch that defines a pipeline containing multiple tables with each table containing multiple flow entries. Any variability in the switch that is outside of the TTP is covered as an extension, in much the same way that you could add features to the uniform car description, such as special lights or two versus four seats. Because real-world switches from different vendors can now be described as a set of TTPs, they can be easily programmed to do their jobs, without users having to worry about any underlying details, such as how they were built or with what components. It’s really no different than being able to drive say, a sports car, without having to be concerned with what type of engine it has. At the end of the day, that means greater adoption of the OpenFlow standard on hardware forwarding targets and, with broad adoption of common TTPs, easier controller implementation will surely follow. 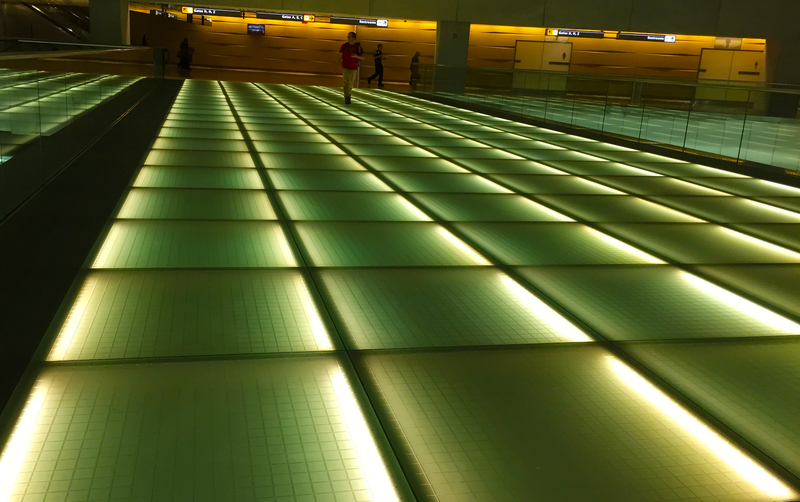 While the OFN’s FAWG was able to come up with a way for OpenFlow to understand real-world switches in a uniform manner, its efforts do nothing to address how to map the real-world switch to the TTP model in OpenFlow 1.3.1. And, that means deploying OpenFlow 1.3.1 in real-world deployments is neither quick nor easy. One resolution to this dilemma comes from an industry source and it takes the form of an open source abstraction layer known as OpenFlow-Data Plan Abstract (OF-DPA) 1.0. OF-DPA essentially homogenizes the underlying switch so that it meets the OpenFlow 1.3.1 model. Or more simply put, it takes an SUV or sedan and makes it look like a generic car model. With little doubt, OpenFlow is hoping to play a critical role in transforming the future of networking. OpenFlow 1.3.1 and TTPs, by enabling OpenFlow on industry standard switches, also aims to contribute to that transformation. Now, developments like OF-DPA are taking things one step further by making deployment of SDN in existing switch networks quick and easy. These advances bode well for enabling SDN on carrier networks, and that means network administrators will be able to roll out new services and functionality faster and with fewer errors, and more easily balance network loads. It’s capabilities like this that make SDN such a compelling answer to the complex challenges facing today’s networks and data centers. Nicholas (Nick) Ilyadis serves as Vice President and Chief Technical Officer of Broadcom’s Infrastructure and Networking Group (ING), where he is responsible for product strategy and cross portfolio initiatives for a broad portfolio of Ethernet chip products including network switches, high speed controllers, PHYs, enterprise WLAN, SerDes, silicon photonics, processors and security. Prior to Broadcom, Ilyadis served as Vice President of Engineering for Enterprise Data Products at Nortel Networks and held various engineering positions at Digital Equipment Corporation and Itek Optical Systems. Ilyadis holds an MSEE from the University of New Hampshire and a BTEE from the Rochester Institute of Technology. Ilyadis is a senior member of the IEEE and contributes to both the IEEE Computer and Communications Societies. Corsa Technology is a networking company that offers a full, OpenFlow programmable data plane that delivers performance, flexibility, and scale. Its DP6400 series switch offers full support for OpenFlow 1.3, with multiple match/action tables, deep packet buffers and fast flow-mod update capability in a fully programmable platform. In September 2014, Cavium made its entrance into the merchant Ethernet switching silicon market with the launch of its programmable XPliant Packet Architecture and chips. The technology for this new product line originates with XPliant, a Silicon Valley start-up that Cavium agreed to acquire in July. The new products target switches for cloud / enterprise data centers and service provider infrastructure, for both top-of-rack and backbone applications. The company said its design approach with its XPliant Packet Architecture was to take the dedicated function blocks present in conventional Layer 2 switching silicon and replace then will a flexible Table Type structure that enables software personalities to dictate the exact operation to be performed – for packet parsing, table look-ups, packet re-writes, fabric scheduling, and statistics and counters – without impacting performance. The company said its design fits well with the spine/leaf architecture of scale-out data centers. Ixia announced support for OpenFlow enabled switches from industry leading manufacturers for its ControlTower distributed network visibility platform. Supported products include Arista, Dell and HP OpenFlow enabled switches. Ixia said its ControlTower visibility solution allows customers to leverage SDN and seamlessly layer the sophisticated management and advanced processing features of Ixia’s Net Tool Optimizer (NTO) family of solutions on top of the flexibility and baseline feature set provided by OpenFlow switches. The Open Networking Foundation (ONF) announced the appointment of Saurav Das as principal system architect, and the establishment of a new project to build upon the OpenFlow Configuration and Management Protocol (OF-CONFIG) to support Open vSwitch (OVS). As Principal System Architect, Dr. Saurav brings deep SDN and networking software expertise to support new ONF development projects, working with ONF’s CTO and Software Leadership Councils. 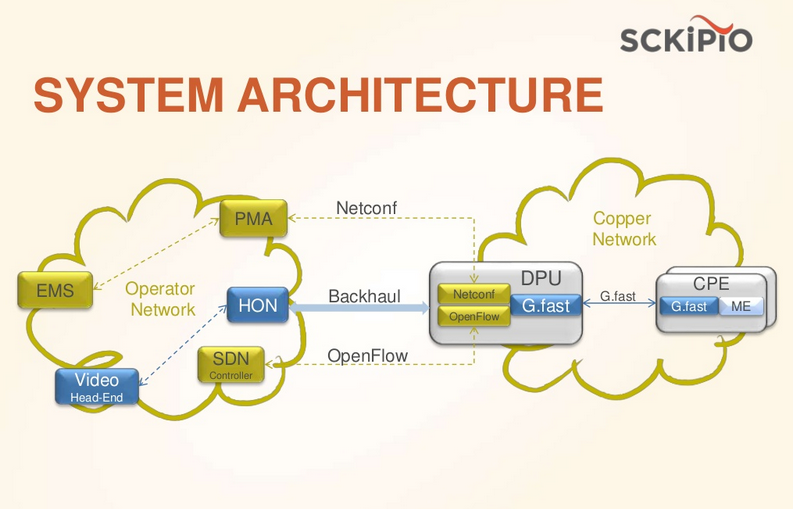 Saurav’s background in SDN can be traced back to his doctoral research at Stanford University. Under the direction of Professor Nick McKeown (a member of the ONF Board of Directors), he was part of the research group at Stanford that gave birth to SDN as we know it. His work developed a converged IP/MPLS/Optical WAN architecturally founded on SDN and OpenFlow. Post-graduation, he worked as part of the engineering team at Big Switch Networks, investigating SDN platform scalability in large data center networks. Sckipio Technologies, a start-up based in Israel, demonstrated OpenFlow control over a commercial G.fast DPU hardware. The demonstration includes a 16-port fully vectored Sckipio DP3000-EVM G.fast Distribution Point Unit device transmitting over a 50 meter twisted pair binder to 16 separate Sckipio CP1000-EVM units. Sckipio said its demonstration shows ultra high-speed broadband access over telephone wires being controlled using an open framework instead of utilizing proprietary approaches. The Open Networking Lab, ON.Lab, and leading service providers, including AT&T, NTT Communications and key vendors, are releasing an open source SDN Open Network Operating System (ONOS) for Service Providers that enables agile service creation and deployment at scale on any hardware, including white boxes. ONOS will be available for download starting later today, Friday, Dec. 5. ONOS features a highly available, scalable SDN control plane featuring northbound and southbound open APIs and paradigms for a diversity of management, control, and service applications across mission critical networks. ON.Lab said it was architected to provide high availability, scalability, performance and rich northbound and southbound abstractions. Pluggable southbound for supporting a diversity of devices and protocols. "The ONOS project partnership was formed with a unique blend of service providers, vendors and ON.Lab to accelerate the adoption of SDN by providers," said Bill Snow, vice president of Engineering at ON.Lab. "A highly available and scalable open source SDN OS platform will help transform service provider networks by delivering significant CapEx and OpEx savings and enabling new revenue-generating services. The first release of ONOS is the start of the journey towards service provider network transformation." "2015 will be a pivotal year for the open source ONOS project," said Guru Parulkar, executive director of ON.Lab. "We will grow the ONOS community, harden and enhance the current architecture and code, and focus all of our efforts on accelerating SDN adoption in service provider and mission critical networks." Founding members who are funding and contributing to the ONOS initiative include AT&T, NTT Communications, Ciena, Fujitsu, Huawei, Intel, NEC; and members who are collaborating and contributing to ONOS include Infoblox, SRI, Internet2, CNIT and Create-Net. 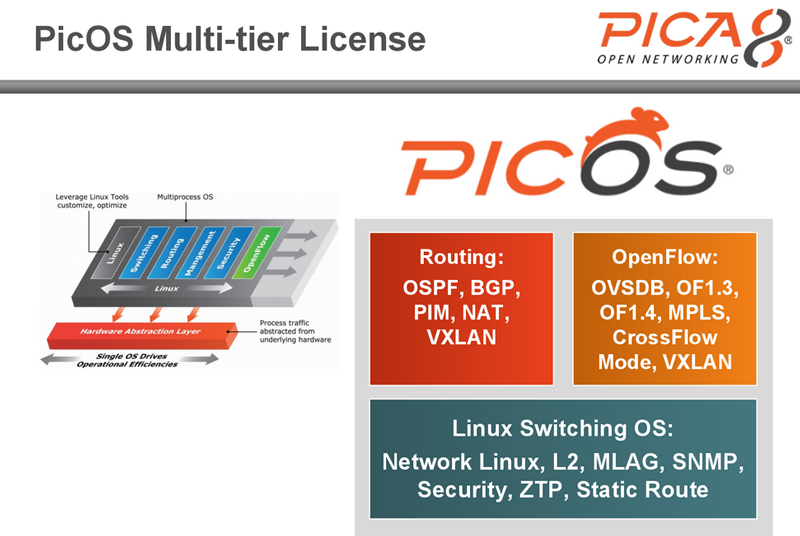 Pica8 introduced a new capability that lets its PicOS bare metal switch operating system integrate OpenFlow-based applications and business-logic policies into existing Layer-2 / Layer-3 networks. The new CrossFlow Networking lets administrators run L2/L3 protocols and OpenFlow on the same switch at the same time. This lets users leverage OpenFlow for policy-driven applications to drive business logic into the network, while leveraging their network topology and protocols like OSPF and BGP for the most efficient packet transport and performance. Pica8 said its CrossFlow Networking brings the potential to significantly accelerate SDN adoption because customers are able to run OpenFlow on the existing L2/L3 network. In a traditional data center that uses Layer-2 / Layer-3 switching and routing, monitoring and tapping can be done on the switches with rules triggered by the OpenFlow protocol. 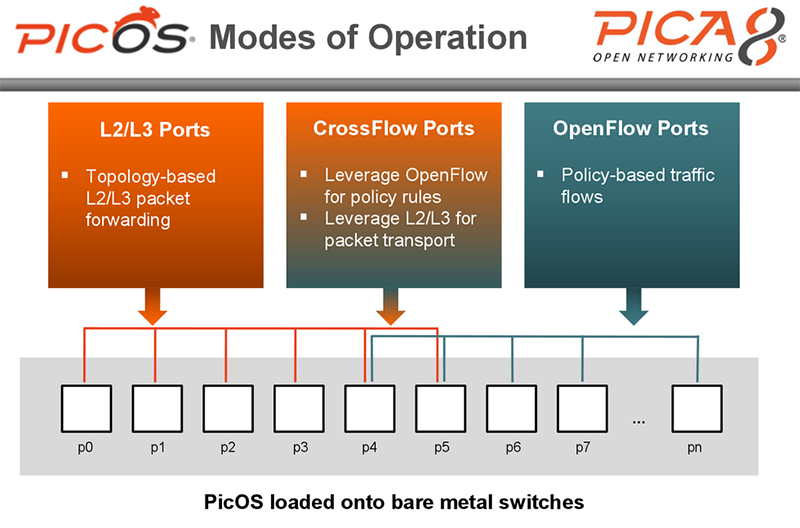 Available in PicOS 2.4, CrossFlow allows every port in the bare metal switch the ability to act as either a legacy or a CrossFlow port. A legacy port uses traditional Layer-2 / Layer- 3 switch (OVS) commands can be used, either locally via OVS commands or via an SDN controller using OpenFlow and OVSDB. Pica8 currently claims over 320 customers. Pica8 is based in Palo Alto, California with development offices in Beijing. In October, Pica8 announced $12.5 million in Series B funding from a group of investors led by VantagePoint Capital Partners, Cross Head and Pacific Venture Partners (PVP), bringing its total funding to date to over $20 million. 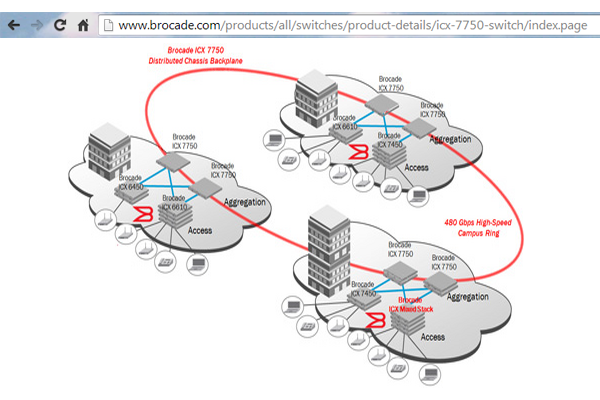 Brocade unveiled a number of new campus network products, including the Brocade ICX 7750-based distributed chassis, the new Brocade ICX 7450 enterprise campus stackable switch, and the availability of OpenFlow 1.3 support for emerging campus SDN applications. In addition, Brocade and Aruba are working together on open standards-based unified wired and wireless network access. The collaboration is expected to yield new product releases of Brocade Network Advisor 12.3, Aruba Airwave 8.0, and Brocade FastIron 8.0.20 with Aruba ClearPass CoA support. 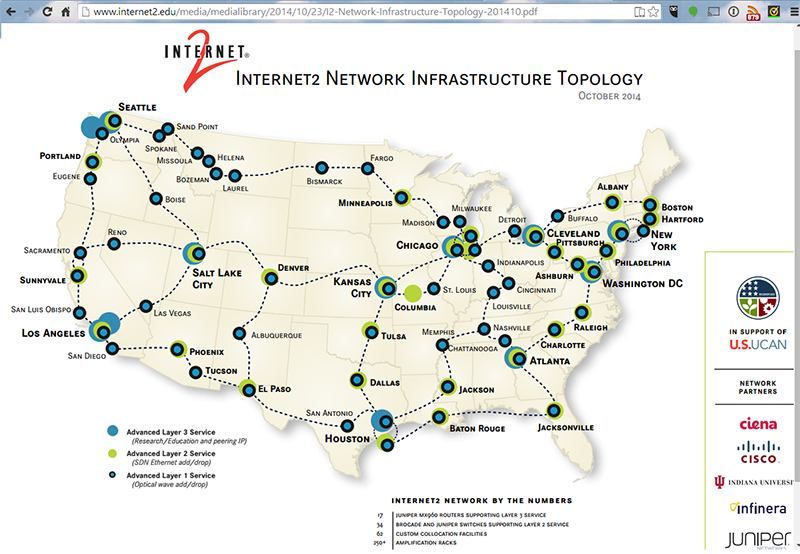 The Internet2 last week marked a major milestone in its network architecture by demonstrating the first nationwide, multi-tenant SDN-powered virtualized network capability. The announcement was made at the 2014 Technology Exchange held last week in Indianapolis. Conceptually, the virtualization enables the physical Internet2 Network to operate in isolated “slices” by leveraging innovations native to the Internet2 Network, including its 100G interfaces. The new SDN capability is driven by “FlowSpace Firewall” software installed in the Internet2 production network. This allows slices of OpenFlow capabilities to be partitioned across nearly forty 100G-attached access nodes throughout the country. The software protects each network slice from overconsumption of resources by other slices. The Internet2 says this first-in-class capability is now available to support the important work of the research and education (R&E) community’s data-intensive science and academic operations. During the 2014 Technology Exchange conference, several initiatives were announced to build large-scale production cloud computing, next-generation IP and peering fabrics in virtual slices of the Internet2 Network. These include two $10 million projects, called Chameleon and CloudLab, underwritten by the National Science Foundation (NSF). “By connecting CloudLab to Internet2's nationwide SDN network, we can give researchers a level of end-to-end network programmability that is unprecedented in a cloud platform, said Robert Ricci, a research assistant professor of computer science at the University of Utah and principal investigator of CloudLab. Having this level of control, programmability, and visibility into the network will enable the research community to push the boundaries of cloud networking and explore the future of network architectures for the cloud. The Open Networking Foundation (ONF) completed its fifth semi-annual PlugFest last month at two of ONF’s global testing facilities: the Beijing Internet Institute (BII) in Beijing, China and the Indiana Center for Network Translational Research and Education (InCNTRE) at Indiana University. This was the first time on ONF PlugFest occurred outside the U.S. and the first time it was staged simultaneously in multiple locations. The event provided participating companies the opportunity to test for interoperability and enhance implementations of OpenFlow v1.3 in commercial and test controllers and switches. OpenFlow v1.3 includes capabilities that are finely tuned for commercial and enterprise networks, such as quality-of-service, Q-in-Q VLAN tunneling, group tables, active-standby controller, and IPv6. Attendees of the PlugFest included approximately 50 representatives from 18 participating ONF member companies, including Brocade, Centec Networks, Digital China Networks, Ltd., Freescale, GreeNet, H3C, HP, IBM, Infoblox, Ixia (Net Optics), Luxoft, NEC, Netronome, NoviFlow, Pica8, Spirent, xNet, and ZTE. 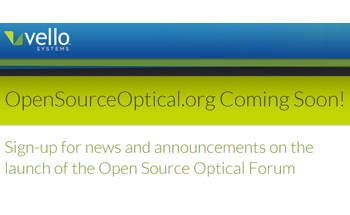 A new Open Source Optical (OSO) Forum has been established to promote the adoption of standards-based, interchangeable, easy-to-use, and power-efficient optical networking technologies into next-generation data centers and cloud environments. The new forum, which was initiated by Vello Systems and includes the initial participation of Accelink, CoAdna, CrossFiber, O-Net, PacketLight and Pacnet, aims to bring together optical component and system vendors, software companies, channel partners and end-users in order to define and promote OpenFlow-based, merchant-optical networking solutions. Vello's mission is to provide the software that fundamentally changes IT consumption models, making them better tailored to the demands of enterprise and individual end users. Customers are calling for more flexibility and new tools to realize their IT delivery solutions. Vello's goal has been to unify standard software with vendor-agnostic merchant hardware to ease adoption by users," said Karl May, CEO, Vello Systems. "One major goal with OSO is to decouple the hardware and software innovation cycles and give vendors in both categories greater freedom to innovate. We want to extend the open networking revolution to optical systems." The OSO Forum organizers expect that some members will simply port OSO software onto their existing optical systems, making them instantly compatible with OpenFlow controller and application frameworks. Other members may choose to build next-generation Native OpenFlow, enterprise-friendly 10G/40G/100G 1RU "pizza box" optical systems, or other appliances, as their go-to-market solutions. Moving forward, any software solution that supports OpenFlow 1.4 can also be used to run OSO-based optical solutions. Vello will also be making the optical extensions generally available to be incorporated into other OpenFlow network controller frameworks. Importantly, OSO software will include the optical extensions that are part of OpenFlow Version 1.4, which were authored and contributed by Vello in the Open Networking Foundation. "Specific application of OpenFlow-based SDN to optical components and networks opens up novel opportunities to add connectivity options within and between data centers, improve price-performance, and apply dynamic software control to flexible, application-independent infrastructure," said Dan Pitt, executive director of the Open Networking Foundation. "We look forward to collaborating with the OSO community to understand their requirements and contribute solutions." The Open Networking Foundation (ONF) released an open-source network tapping application built on OpenFlow and designed to serve as an educational resource for programmers. The application was developed with Wiretap Labs, a Silicon Valley-based consultancy specializing in custom development for cloud, security and SDN solutions. of March 2014. It is based on OpenFlow 1.0 and was written to run on an OpenDaylight controller. SampleTap has been tested and will be demonstrated with OpenFlow Conformance-Certified NEC switches. It was based on OpenFlow 1.0 because the recently announced OpenDaylight Hydrogen release, which supports OpenFlow 1.3, was not available at the time of the app’s writing. It was also designed for easy portability to other network operating systems and support later versions of OpenFlow. The ONF noted that a number of its member companies, including Big Switch Networks, Cisco, Gigamon, HP, IBM, Ixia (Net Optics), NEC, and NetScout, offer or plan to offer commercial-grade network tapping products. "We hear tremendous interest from users who want to test OpenFlow in their networks and this app is the perfect way for them to get started," said Neela Jacques, executive director, OpenDaylight. "We are excited that ONF used OpenDaylight's controller for this and look forward to hearing how these open source technologies are being implemented in software-defined networks." ONF will be demonstrating the SampleTap application at this week's Open Networking Summit in Santa Clara. 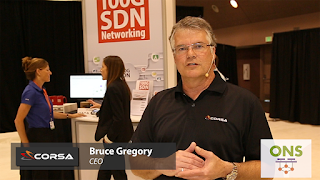 What's new on the agenda for this year's Open Networking Summit? Guru Parulkar, Chair of the Open Networking Summit, previews some of the highlights of this year's ONS agenda. Keynotes include: Vinod Khosla (Khosla Ventures, John Donovan (AT&T), Albert Greenberg (Microsoft), Amin Vahdat (Google) and others. The Open Networking Foundation (ONF) has appointed Dr. Serge Manning, senior manager for corporate standards at Huawei, as the chairperson of the ONF Wireless and Mobile Working Group. The recently formed Working Group was created to collect use cases and determine architectural and protocol requirements for extending OpenFlow-based technologies to wireless and mobile domains. The goal is to propose common ground architectural frameworks that will encompass different elements of OpenFlow-based or OpenFlow-oriented wireless and mobile network domains. Already the group has created three projects, related to the mobile packet core, wireless backhaul, and integrated fixed/wireless operation in the enterprise. Work gets underway at The Open Networking Foundation's (ONF's) new Wireless and Mobile Working Group. Dan Pitt, Executive Director of the ONF, comments on the appointment of Dr. Serge Manning, senior manager for corporate standards at Huawei, as chairperson of the working group. The Open Networking Foundation (ONF) conducted its fourth, semi-annual PlugFest earlier this month at the Spirent Proof of Concept (SPOC) Lab in Sunnyvale, California. The event focused on the testing of OpenFlow v1.3 and the OpenFlow Management and Configuration Protocol (OF-Config) v1.1.1 through a “speed dating” format. Participating companies’ switches, controllers, and applications were paired together through one-on-one testing and small topologies, generating hundreds of testing permutations and completing several months worth of work during one week-long event. Spirent Communications and Luxoft announced an OpenFlow Compliance Testing solution for automating QA and regression testing for OpenFlow products. The solution is being shown at the fourth semi-annual ONF Plugfest being hosted at the Spirent Proof of Concept (SPOC) lab in Sunnyvale, CA, November 4-8, 2013. OpenFlow 1.3 and 1.4 Compliance Testing – Spirent’s iTest OpenFlow Compliance Test Solution Pack, powered by Luxoft, includes more than 400 test cases that support the latest OpenFlow 1.3 and 1.4 specifications. The solution combines Spirent iTest’s easy-to-use GUI and test case development tools with Luxoft’s backend for distributed and parallel execution of comprehensive OpenFlow 1.3 and 1.4 conformance testing. OpenFlow Conformance Certification Preparation – Spirent’s iTest-OFTest Solution Pack addresses the needs of users preparing for ONF Conformance Certification by automating installation, configuration and execution of OFTest, the open source test tool used by ONF for OpenFlow certification testing. QA & Regression Testing Automation for OpenFlow – Spirent iTest enables experienced feature testers and engineers to easily build or extend fully-automated test cases to speed up replication, defect resolution and regression testing. Professional Services & Continuous Integration Software Engineering Practices – Spirent partners with Luxoft to provide on-demand customization, quality assurance and conformance coaching services.